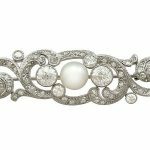 What are Mabé pearls and why are they so special? 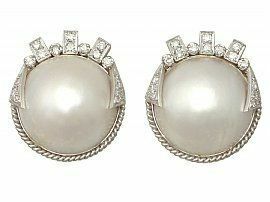 Mabé (pronounced Mar-bay) are also known as half-pearls or blister pearls. The name of Mabé pearls comes from the Japanese name of a Winged Oyster variety, which is Mabé gai. 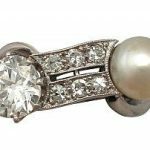 Mabé pearls are an incredibly interesting and distinctive pearl type; they possess all of the beautiful qualities that pearls are famed for such as the flashes of colours that pearls display. They are formed however, on the inside of an oyster’s shell, rather than within its tissue. 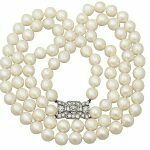 Many mabé pearls are technically a cultured pearls, as they are frequently man-made and not completely created by nature alone. The lustre of Mabé pearls is slightly different to natural pearls, often Mabé pearls have a glossier appearance. Mabé pearls come in a huge spectrum of colours and the predominant colours are dependent on the origin of the pearls. How are Mabe Pearls Made? 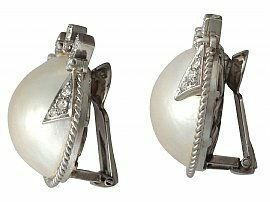 Mabé pearls are grown on the inside of the pearl oyster’s shell, against the ‘wall’ of the shell rather than inside the body of the mollusc itself. This results in the Mabé pearls being created as half pearls, or ‘blister’ pearls. In the case of cultured Mabé pearl: after the mould is applied to the inner wall of the oyster shell, the oyster is then returned to the water to create layers of nacre over the man-made ‘nucleus’ (as it would be known with traditional pearl growth). Eventually, the oyster will produce a half pearl, or blister pearl. This process is known as ‘seeding’ a Mabé pearl. Years of training is required in order carry out this delicate task. After the oyster has been placed back in its water, the process of patiently waiting for the pearl to grow continues to test the expert oyster seeders. Mabé pearls are especially interesting because they are malleable. 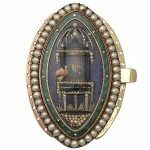 They can be created in any shape by placing a ‘mould’ inside the shell so that the pearl grows around the mould. However, conventional spherical shapes such as teardrops and ovals are the most popular and in demand with customers. After the pearls have been scraped, they are filled or backed with mother of pearl in a crushed form. Mabé pearls are produced by Akoya, South Sea, Tahitian and Freshwater molluscs. However, the most popular varieties are the Winged Oyster ( Ptera Penguin), The Rainbow Lip Oyster (Ptera Sterna), White and Golden South Sea Pearl Oysters (Pinctada Maxima) and Haliotis Iris (The Abalone Mabé Pearl). The most in demand of these is The Winged Oyster- so named because of its ‘wing’ or ‘fin’ which extends out of the lip of the oyster’s shell. The Winged Oyster is responsible for around three quarters of all of the world’s Mabé pearl production. The Mabé pearls that are created by The Winged Oyster have a silver and grey tone, with flashes of iridescence in green, blue, purple and pink. The Rainbow Lipped Oyster is named after its high level of iridescence, with a more intense colour show than in other types of Mabé pearls. These pearls are much rarer than the Winged Oyster Pearls and are created off the Gulf of California. The White and Golden South Sea Pearl Oysters produce pearls or blister pearls which are 10mm in diameter and up! These pearls are white with silver and golden tones depending on the specific variety of oyster. They are produced off the coast of Australia and the Philippine Islands. The Abalone Mabé Pearl is cultured in New Zealand. These Mabé pearls are the largest variety of pearl (they can grow to around 20mm after growing for around 18 months) and are oval and droplet shaped. These abalone Mabé pearls are usually a vibrant blue with flashes of pink, gold and green iridescence. Mabé pearls are fantastic for use in jewellery since they can be manipulated into any shape or style that the client or the retailer desires. Mabé pearls are softer than gemstones, as all pearls are. Pearls should be cared for with a delicate hand, and only cleaned with specific, gentle tools. 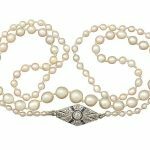 When in doubt or in possession of a particularly dirty set of pearls, have them professionally cleaned rather than risk damaging these precious – natural – wonders. Avoidance of detergents and cleaning products of any description is strongly advised. The unique process of development and creation explains their appeal. 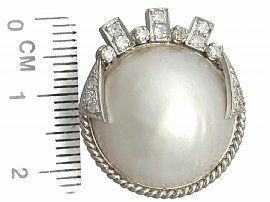 Here at AC Silver, we are proud to be able to offer our customers a wonderfully example of large Mabé pearl earrings measuring 22mm across their width (including their 9ct white gold and diamond setting). 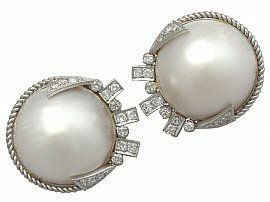 These large vintage Mabe pearls are of a wonderful quality and one of the finest of their type that we have found! Next Entry: What is a Candelabrum?